Before you can improve yourself, you must know and accept yourself. But how? According to Gretchen Rubin (author of The Happiness Project and Better Than Before, and co-host of the podcast Happier with Gretchen Rubin) the key lies in knowing your tendency, or how you respond to inner and outer expectations. Once you do, keeping your New Year’s resolutions, sticking to an exercise routine, and even communicating with your partner or kids gets a whole lot easier. 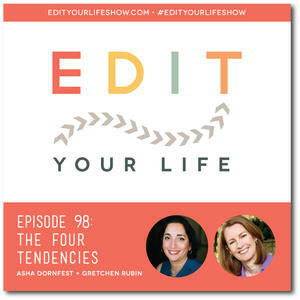 In Episode 98 of Edit Your Life, Asha and Gretchen talk about her new book, The Four Tendencies, in which she lays out a simple framework for understanding our internal motivations (Obligers, Upholders, Questioners, or Rebels). They share the quirks and challenges of their own tendencies, discuss the inherent tension between improving and accepting ourselves, and talk about how the Four Tendencies play out in relationships. What’s your tendency? Take Gretchen’s quiz and then join the discussion on the Edit Your Life Facebook page (look for the Question Of The Week post).